Happy Monday! Are you staying warm out there?! I hope the cold weather didn’t stop you from having a fun and relaxing weekend. My husband left me for the slopes in Colorado this past weekend (no hint of jealousy there at all), so I was left to fend for myself for a few days while he skied with his brother and dad. I was productive and got things crossed off my list, but it was so nice having him come back on Sunday afternoon. Being the great wife that I am, I made some homemade bread yesterday so he could come home to a warm house filled with the smell of fresh bread (and maybe, partly because I really just wanted to make some bread and I finally had the time to do it — but that’s neither here nor there). While I didn’t make Mom’s Homemade Banana Bread yesterday, it’s just as comforting, warm and inviting for a cold day (which is today!) — plus, it’s even easier than the bread I just made since there’s no yeast involved! This quick bread couldn’t be quicker — literally, just dump and mix everything together. 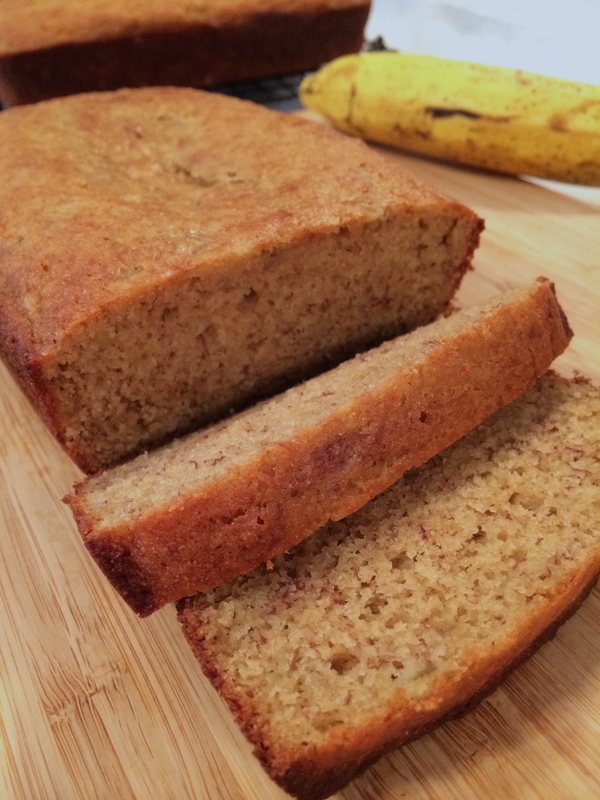 You may have already guessed it, but this banana bread recipe is from my mom. Besides her famous cinnamon rolls, this was another recipe she was an expert at making — possibly because she made it so much for us while growing up. 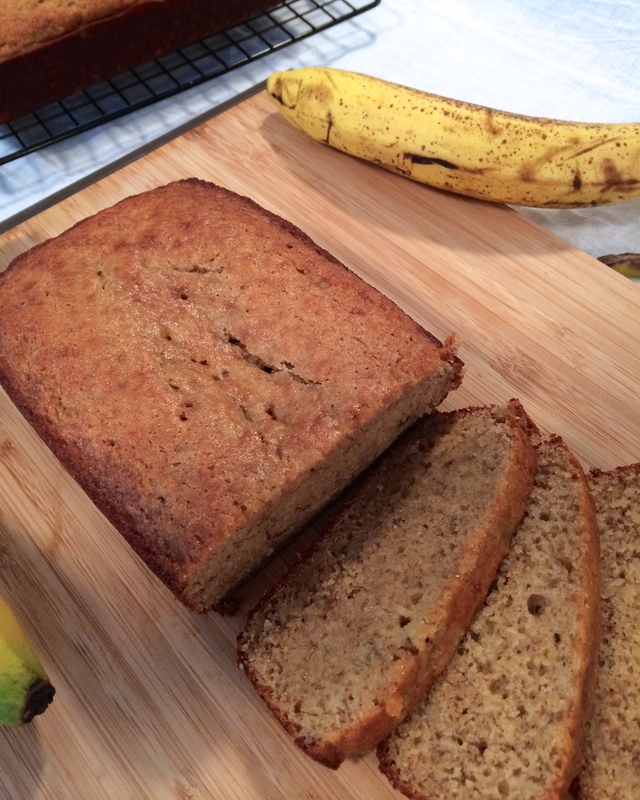 Even to this day, whenever we go home, there’s almost always banana bread ready for us in the morning. While it’s not a hearty or healthy breakfast item I’d recommend having all the time, it is a nice treat once in awhile. Swapping out sour cream for plain yogurt in baked goods or other recipes has become more main stream these days (in case you didn’t know, plain yogurt makes a great, healthy substitution for sour cream in recipes — whatever the amount of sour cream called for in the recipe, use that amount of yogurt instead). But I like to think of my mom as being innovative in the kitchen and directing me in my career choice by using plain yogurt in this recipe and others before it was even a thing. While she used just regular yogurt then (I don’t even think our small grocery store had Greek yogurt), I’ve boosted the protein content and thickness a bit by using nonfat Greek yogurt instead. You know why else this recipe is great? Pretty much everybody has bananas go bad at one point or another, right? This is the perfect way to use them up. When I have bananas get too ripe, I either peel and chop up the bananas and freeze to use in smoothies or I just put the whole banana in the freezer to save for later. 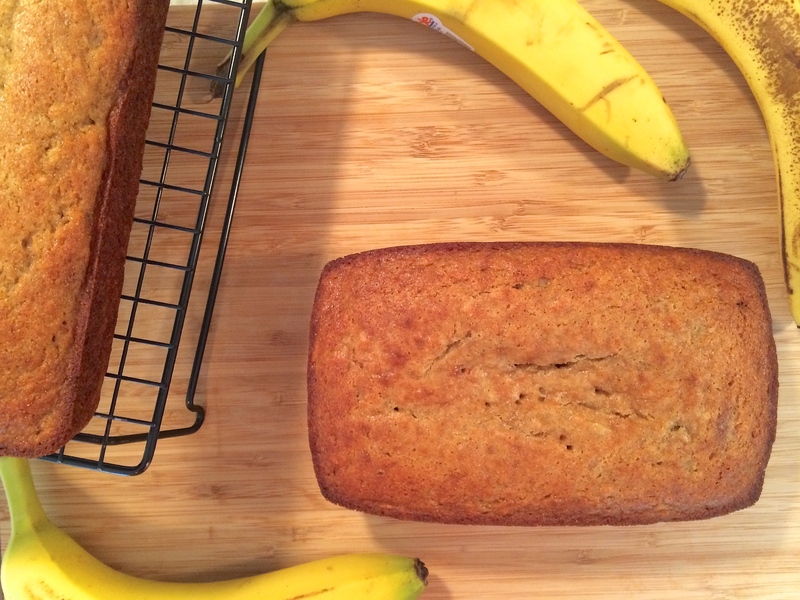 When I’m ready to make banana bread, I take out the whole bananas and let them thaw in the fridge (just make sure they’re in a bag or container as the juices may start to leak out a bit). The previously frozen bananas look awful, but they taste just as good and actually make it incredibly easy to mash. 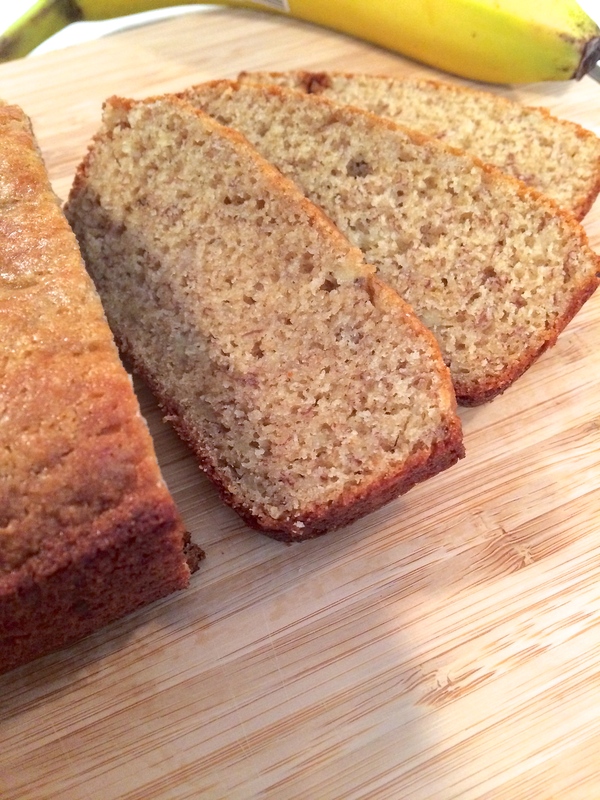 And just a heads up, for banana bread that actually tastes good, only use bananas that are extra ripe (like, almost inedible ripe, preferably). As bananas ripen, their starch turns to sugar, making them sweeter. That’s why nobody really enjoys unripe bananas — the sugar is missing! Any time I’ve made this for people, I get rave reviews. You must give this a try! Here’s one more reason for you: It’s cold outside. This recipe is easy and fast. 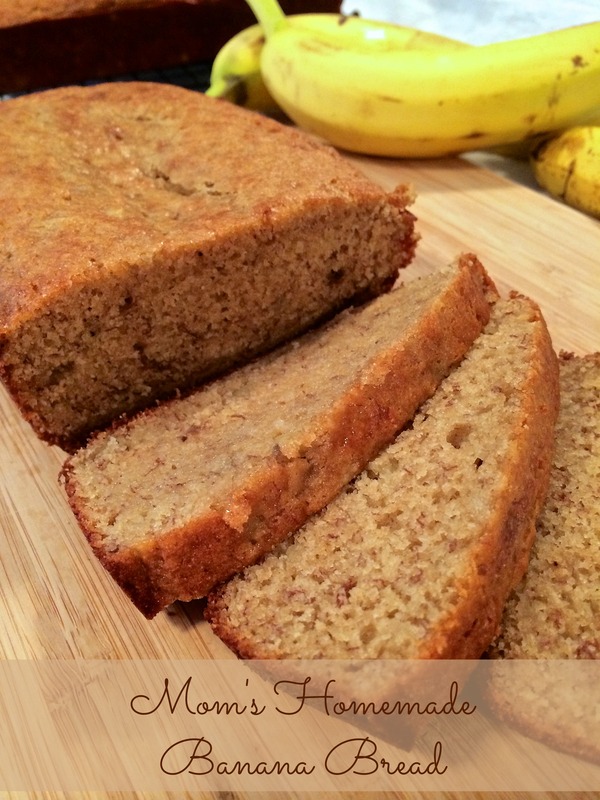 You’ll be enjoying a cup of hot coffee and warm banana bread by tomorrow morning. Enjoy and stay warm! Cream butter and sugar in a stand mixer or with an electric mixer. Add in the eggs and yogurt and mix until combined. Mash the bananas in a small bowl with a fork or potato masher. Pour the mashed bananas and vanilla to the mixture. Add the flour, salt, and baking soda to mixture and mix well until completely combined. Spray two loaf pans with cooking spray. Pour batter equally into the pans. Bake at 375° for 30-40 minutes (depending on size and type of pan, it may take longer; bread is done when you can stick a tooth pick in the middle and it comes out clean; the sides may be getting dark, but that’s okay). Cool just until able to take the bread out of the pans (about 5 minutes) and continue to cool breads on a cooling rack.